Thank you for your interest in one of Auto Source of Texas's online offerings. 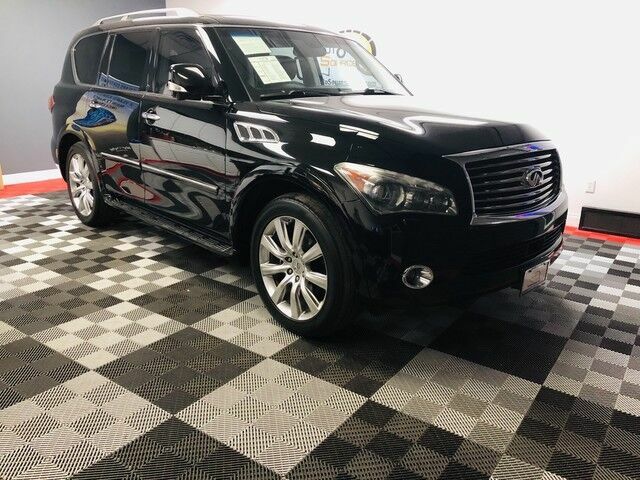 Please continue for more information regarding this 2012 INFINITI QX56 7-passenger with 114,190mi. This INFINITI includes: [H02] TECHNOLOGY PKG Brake Assist Blind Spot Monitor Cruise Control BLACK OBSIDIAN [H01] THEATER PKG Heated Rear Seat(s) Auxiliary Audio Input Entertainment System Power Outlet [B93] STAINLESS STEEL REAR BUMPER PROTECTOR (PIO) GRAPHITE, LEATHER SEAT TRIM Leather Seats [K01] DELUXE TOURING PKG Cooled Front Seat(s) A/C Climate Control Woodgrain Interior Trim Heated Front Seat(s) Premium Sound System Leather Seats *Note - For third party subscriptions or services, please contact the dealer for more information. * Drive home in your new pre-owned vehicle with the knowledge you're fully backed by the CARFAX Buyback Guarantee. Gone are the days of SUVs being the size of a tank and handling like one. This INFINITI QX56 is a perfect example of how SUVs have evolved into vehicles that are as refined as they are rugged. Put performance, safety, beauty, sophistication and all the right amenities into a car, and here it is! Now you can own luxury without the luxury price tag! Equipped with 4WD, this INFINITI QX56 gives you added confidence to tackle the surface of any path you take. Want a mobile theater? This INFINITI QX56 has a premium entertainment package that will keep your passengers entertained with superb enjoyment. Added comfort with contemporary style is the leather interior to heighten the quality and craftsmanship for the INFINITI QX56 This INFINITI QX56 is equipped with navigation, so you no longer have to wonder if you're headed in the right direction. Treat yourself to a wonderful driving experience in this wel- optioned INFINITI QX56 7-passenger. Equipped with the latest in driver comforts, this INFINITI is the benchmark of modern automotive engineering. This wonderfully maintained INFINITI QX56 is in the top 10% of its class when it comes to cleanliness and condition. More information about the 2012 INFINITI QX56: Although some might consider its styling a bit polarizing, the QX56 has a lot to offer for the buyer looking for a full-size body-on-frame sport-utility. Despite its size, the QX56 is smooth, quick, and maneuverable and it features a host of luxury amenities as standard equipment. Strengths of this model include High-end technology features, comfortable seating for eight, excellent stability and utility.